HP Compaq Presario CQ56-103SG (XH187EA): HP Compaq: 299 euro – mega bargain or portable heater? It's gotten around. Such a laptop is a great thing. John Smith can sit around everywhere and surf or write emails. That's why everyone wants them, no matter if domestic engineer, business person or student. The enormous amounts that mushroom on the German market Taiwan or China fortunately provide prices that bring tears into retailers' eyes. 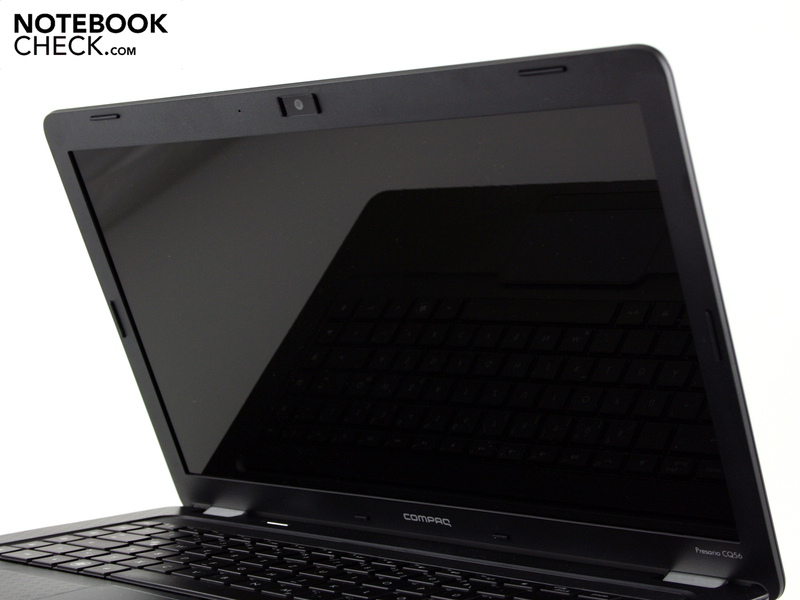 Our test device, HP Compaq Presario CQ56-103SG (XH187EA) sets new limits in the price war. The 15.6 incher costs 299 euro in relating specialized online shops. Of course, the configuration with AMD V140 (single core with 2.30GHz), 2048 MB of RAM, 250 GB hard disk and GPU chipset, ATI Radeon HD 4250, won't be apt for high performance flights. But is there still hope for a proper laptop for surfing and typing in Word? We make the detailed test. 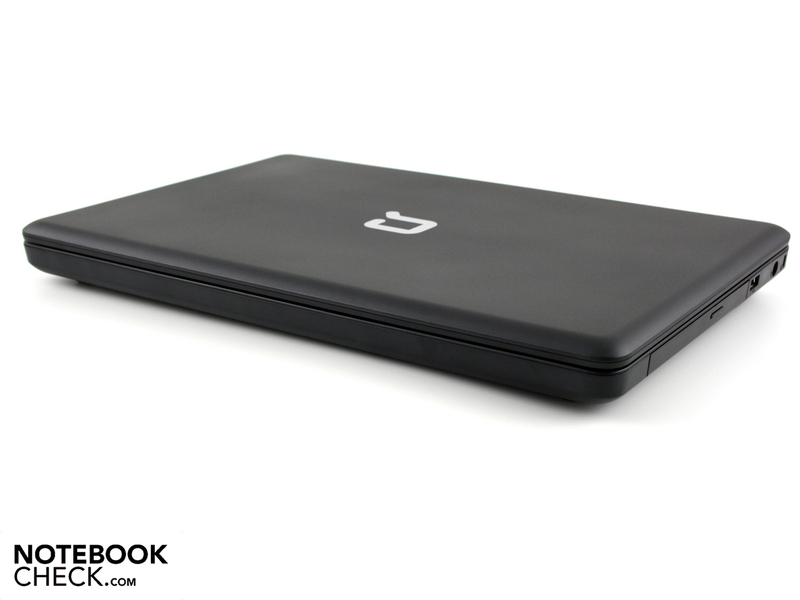 The Compaq Presario CQ56 comes in a case made completely of plastic. Everything looks homogeneous because the black case elements all have the same matt surface. Merely the wrist-rest is an exception. It has a scratch resistant, perforated pattern. The slight wedge-shaped base unit gives the 15.6 incher a rock solid and suitable for everyday use look. If you are looking for sparkle and glamour, you won't find it in this HP. The 2.43 kilogram heavy case is suitable for mobile use due to its resistance, just like for use on the desk in student rooms. The fingers touch a pleasant prism patterned surface on the work area. Fingerprints or greasy stains don't stand a chance. The case is stable and makes a high-end impression with even gaps. It isn't coated, thus accordingly few scratches or chafing should be expected. Both hands can only twist the case marginally. The wrist-rest fits tight everywhere. The same applies to the key bed (even over the DVD drive). We can bend the lid more easily, but also only to a limited degree. The lid's surface can be dented evidently in the center with little pressure. Stable hinges in a budget laptop? The shiny element is the plastic hinges' aluminum cover. The hinges have been pulled so tight that we need both hands for opening. The hinges are mounted securely in the base unit. The maximum opening angle of 135 degrees is sufficient for a use on the lap. Unlocking and removing the battery works single-handedly. It can be removed for use on the desk since it doesn't have any feet. The latter are soft and fairly big, which gives the 15.6 incher a wobble-free and non-slip stance. The base plate can only be dented around the fan openings. Two covers on the bottom bid an option for upgrade: hard disk, RAM (DDR3 SDRAM, one bay unoccupied) and WLAN module (half size mini PCI Express). 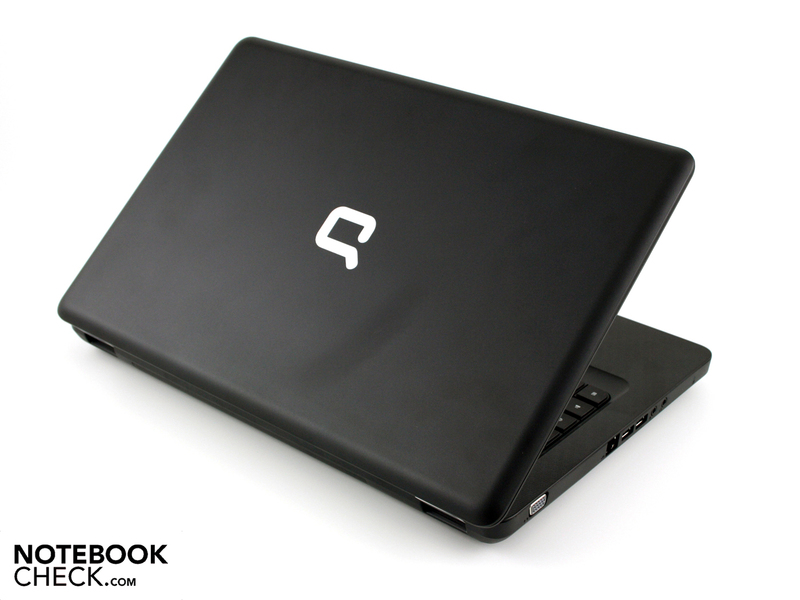 The Presario CQ56 has a very limited amount of connections for connecting peripherals, such as printer, router, mouse or external hard disk. e-SATA (external HDDs), ExpressCard or FireWire don't belong to the array. External monitors or TVs can't even be addressed digitally for the lack of HDMI. There is only a VGA interface available. Even more painful is the lack of a cardreader for memory cards of digital cameras. 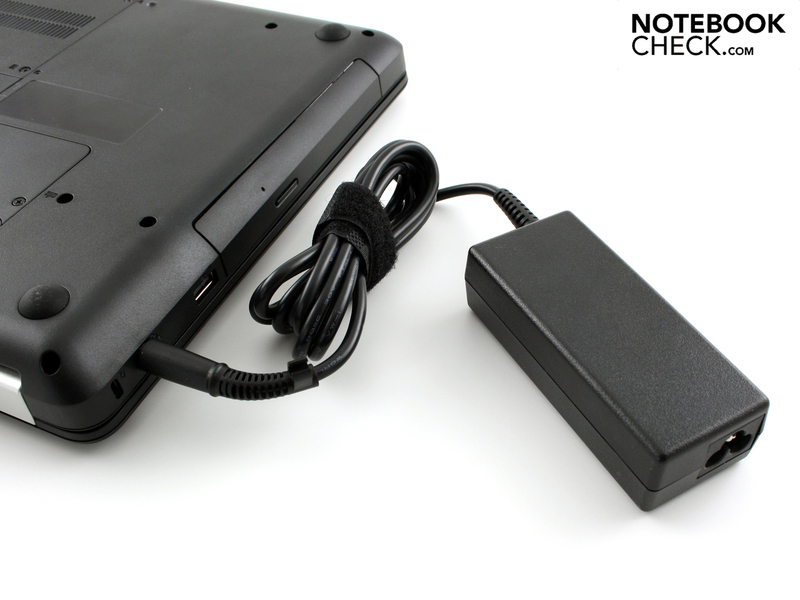 It's been standard in notebooks and netbooks for a long time already. 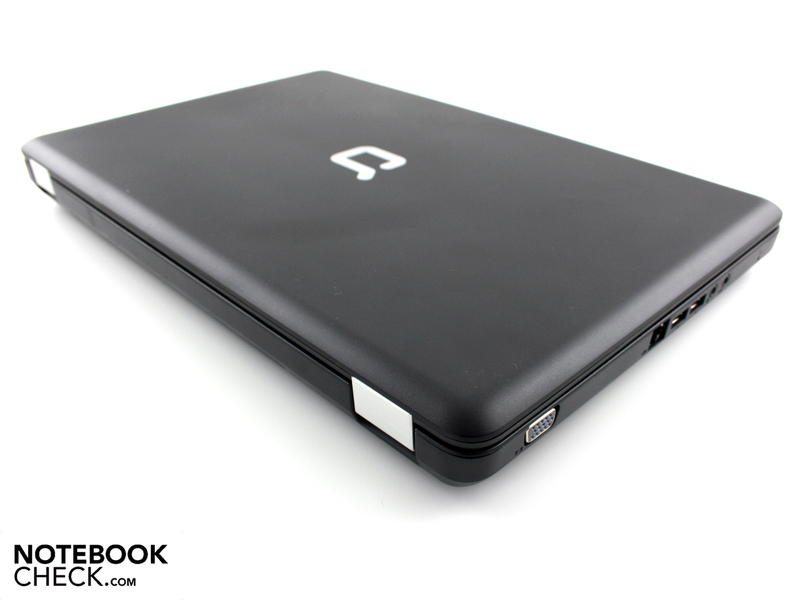 Owners of the CQ56-103SG have to again buy a USB cardreader. At least there are three USB ports. The positioning of the VGA port (left rear area) and the right USB port (right rear area) makes sense for a cleaned up cable running on the desk. It isn't impaired by cables when a mouse is used on the right or left. 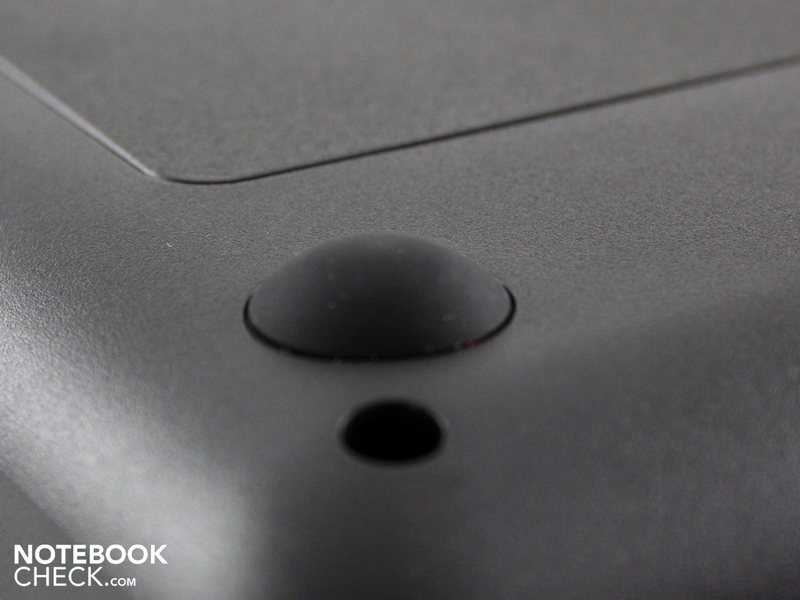 The sunken hinges prevents placing interfaces on the rear. The mini PCIe WLAN adapter supports the fastest WLAN draft-n standard (WLAN 802.11 bgn). A Bluetooth module hasn't been installed in this price category. The Realtek network card (RTL8102/8103/8136) isn't up-to-date and only supports Fast Ethernet. If you use a gigabit switch at home, you won't be able to use it to capacity with the Presario CQ56. Our test system is delivered with the Unix operating system, Suse Linux 11 (free of charge). The Enterprise Desktop alternative is used. We installed Windows 7 Home Premium 64bit for executing the benchmarks. 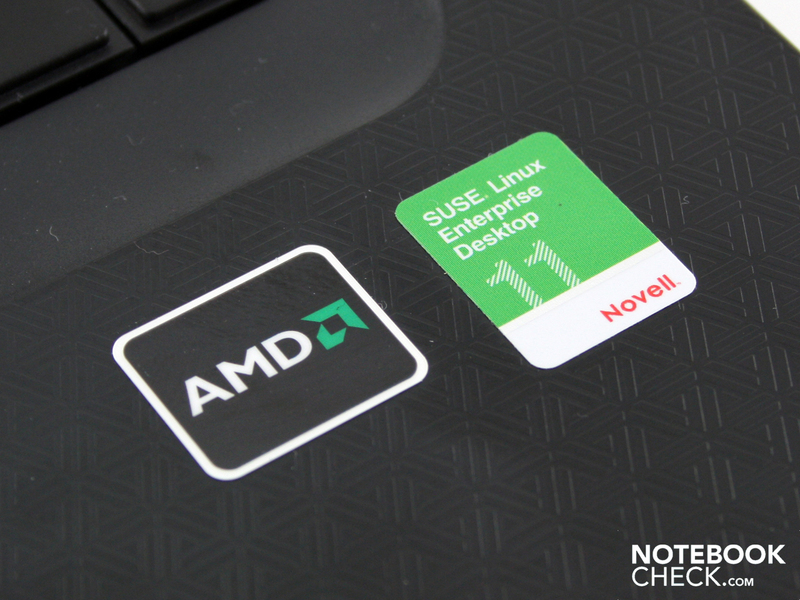 Most buyers of this notebook will likely do the same. There is no driver DVD included. Thus, we had to download all matching device drivers singly by hand (audio, ATI GPU, touchpad, LAN, WLAN, webcam, etc.) for Windows 7 from HP's website. Advantage: There isn't any bloatware on the system. There is only a warranty card and a quick guide in the box. 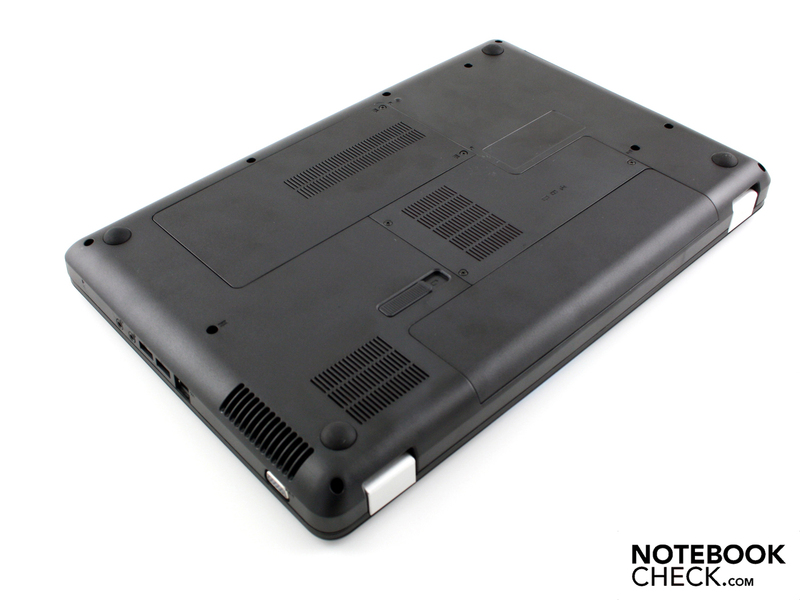 As always in its budget notebooks, HP grants a 12 month warranty via send in service. The buyer thus has to send in the device at his own expense. If you deem this to be too risky, you can buy the two year Care Pack Support with pickup and return service for Presario notebooks ((UM939E) for 59 euro. 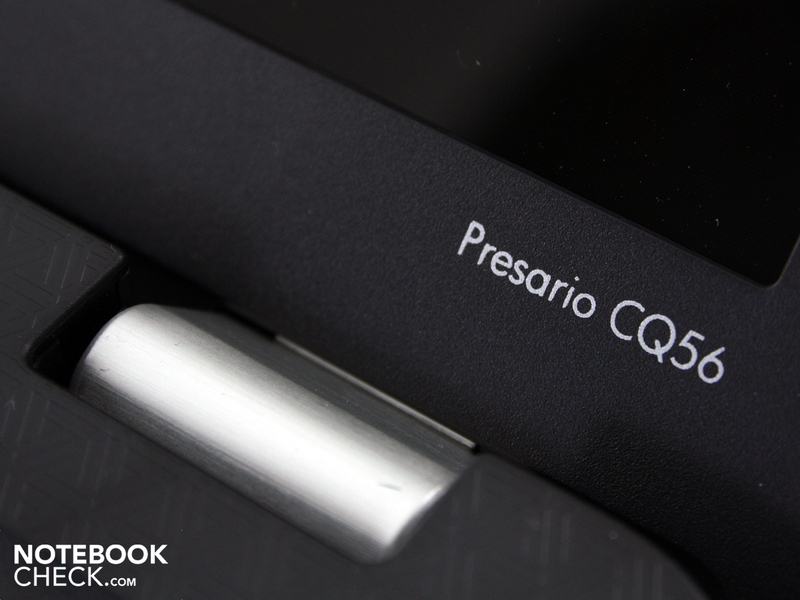 We encountered the Presario CQ56's input devices with the worst expectations. 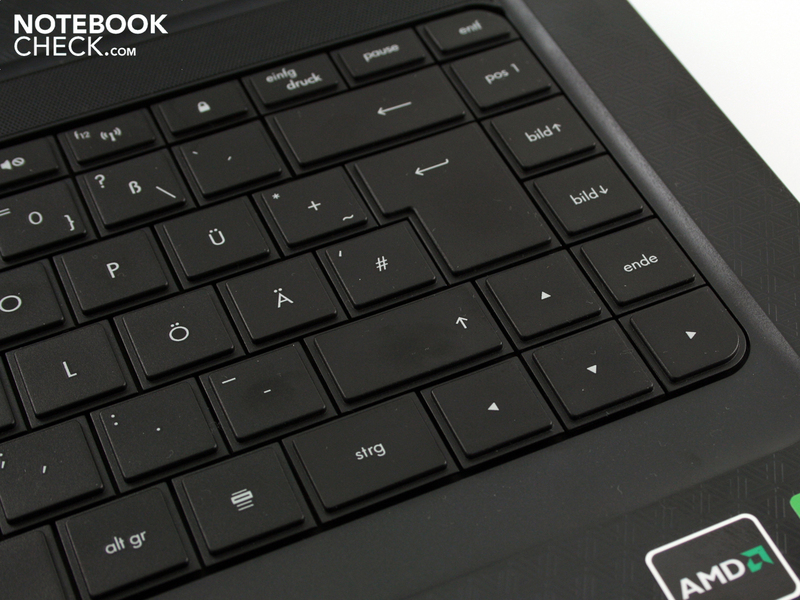 How office suitable can a keyboard be in a 299 euro laptop? We were surprised. Keyboard and touchpad can be used adequately and don't differ from the higher priced models, HP G62 and Compaq Presario CQ62. The keys bid the typist a clear pressure point and a long keystroke length. 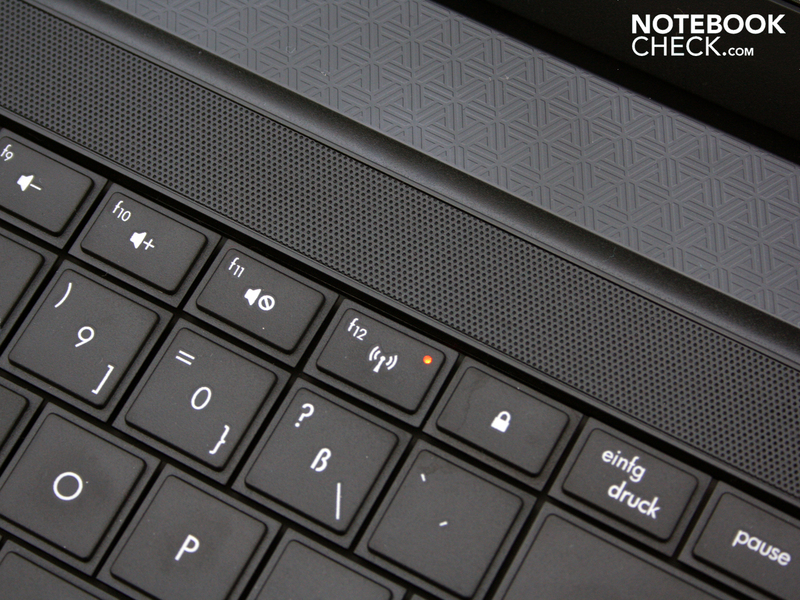 The key stroke with a muffled click noise is firm but not hard. 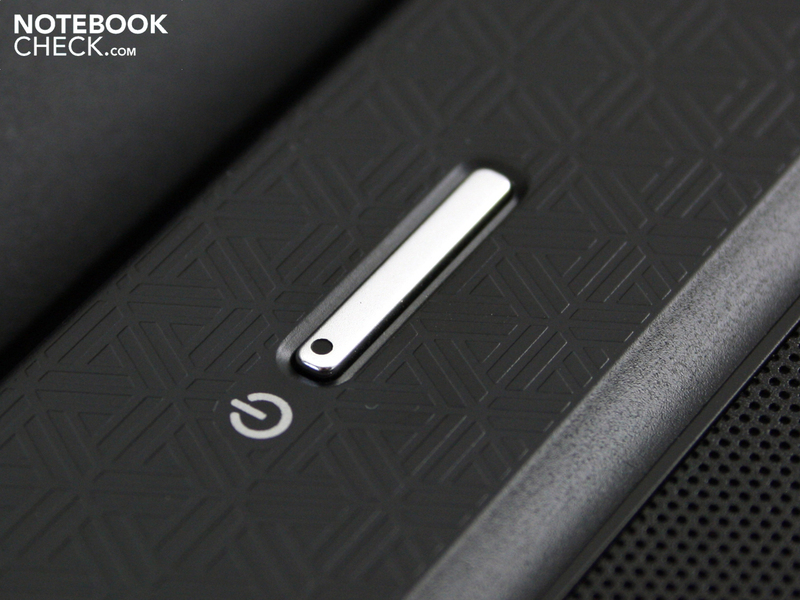 The keys are fitted tight on the entire surface, even over the optical drive. A spongy key bed is frequently a problem of cheap laptops, but not here. HP doesn't use a number pad in favor of a clearly arranged keyboard. Thus, merely the PGUP/PGDN, DEL, HOME and END keys adorn the right area. Especially the delete key directly in the corner (upper right) and the calculator key (lower left) are pleasing since they are always easy to find. 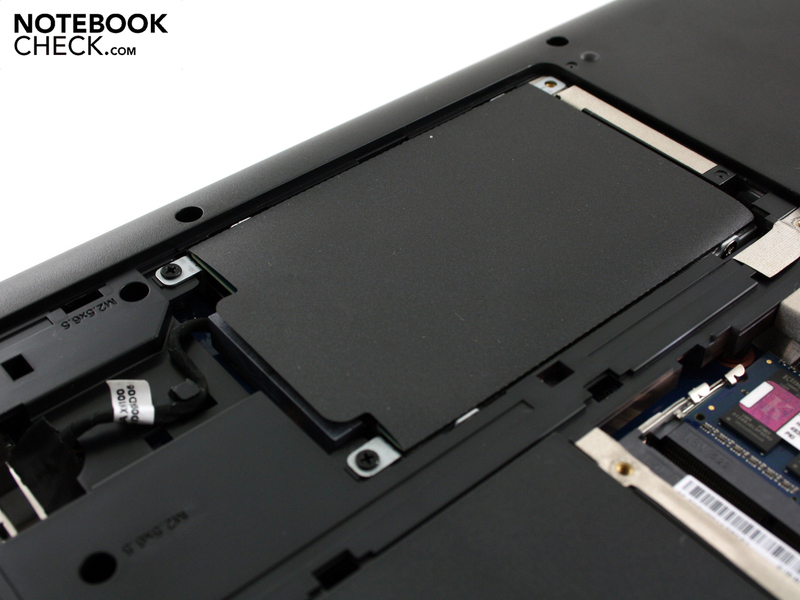 The mouse replacement is a Synaptics multi-touch pad (LuxPad V7.4). The name LuxPad doesn't indicate luxury in terms of quality. 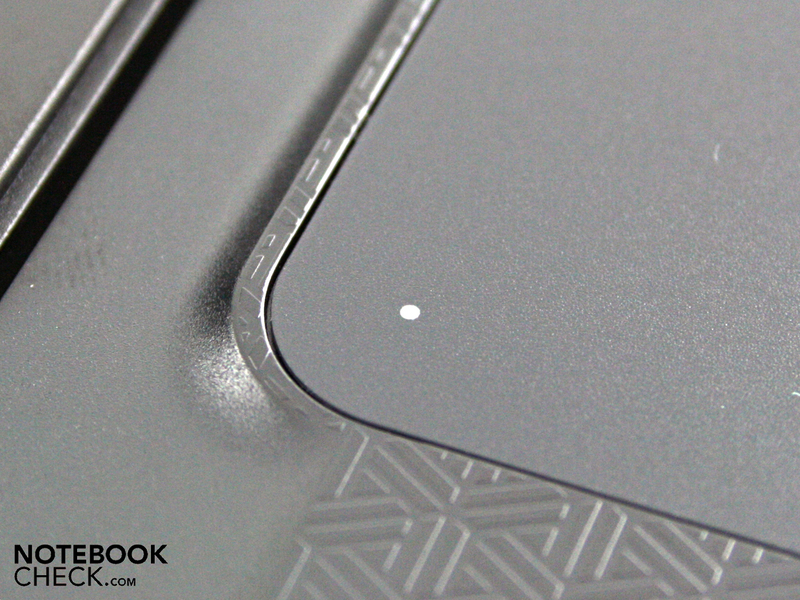 Rather there is a light sensor in the pad's upper left. When we cover it with our hand while typing, the touch surface is disabled. It is supposed to prevent accidental inputs. The mouse pad can't be disabled manually due to the lack of an according FN key, anyway. 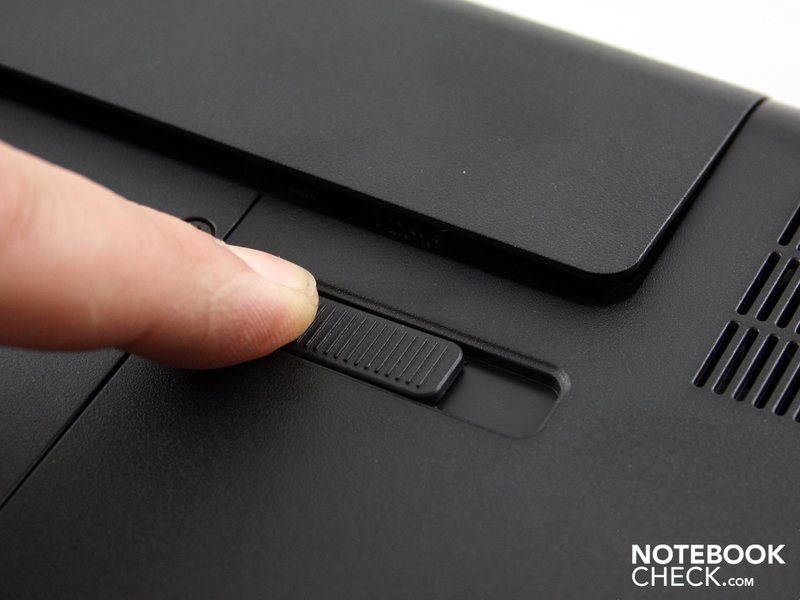 When the right touchpad drivers are installed, the sensor can be set to disable/enable the pad completely. 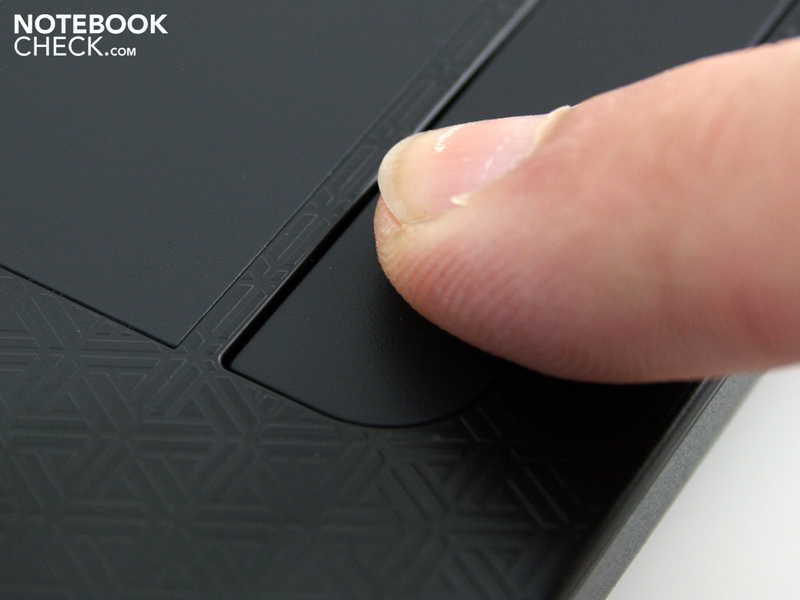 The pad's surface is even with the wrist-rest and can be used smoothly. The LuxPad has a horizontal and vertical scroll bar (visually unmarked). The keys click very quietly, but need a lot of force. The extremely short keystroke length is really annoying. It slows down use a lot and gives an unpleasant feedback. The 15.6 inch display (39.6 cm) already hints a reflective display with the key words "BrighView Display". 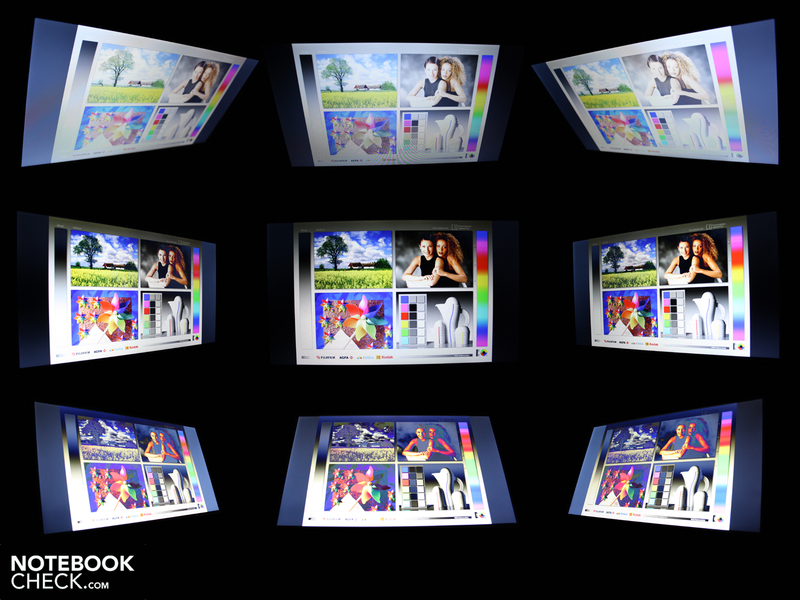 The Innolux screen (model: BT156GW01) has a resolution of 1366x768 pixels (WXGA), as well as a LED backlight. The Innolux screen's weakness is found in the low contrast of 186:1. The low rates are typical for office notebooks. The glare type improves the contrasts optically, but the pallid colors remain visible for the naked eye. A black surface doesn't look like deep black, but rather has a light gray cast. The color spectrum coverage isn't much better. However, this quality is only important for professionals. 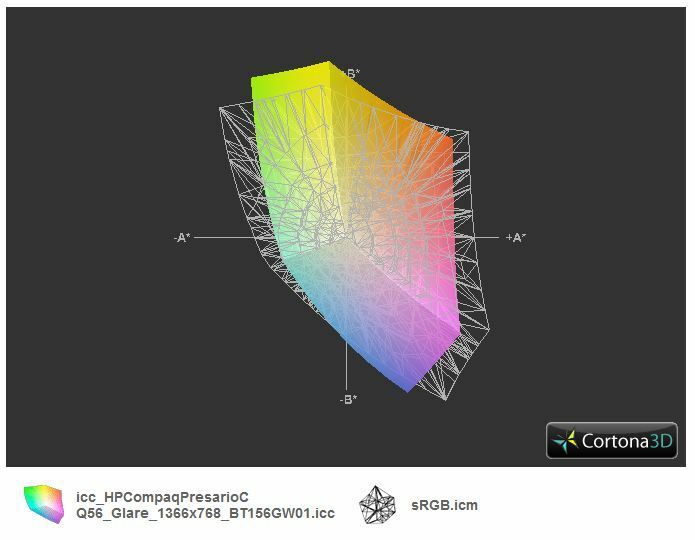 Neither AdobeRGB (t) nor sRGB (t) are moderately covered. 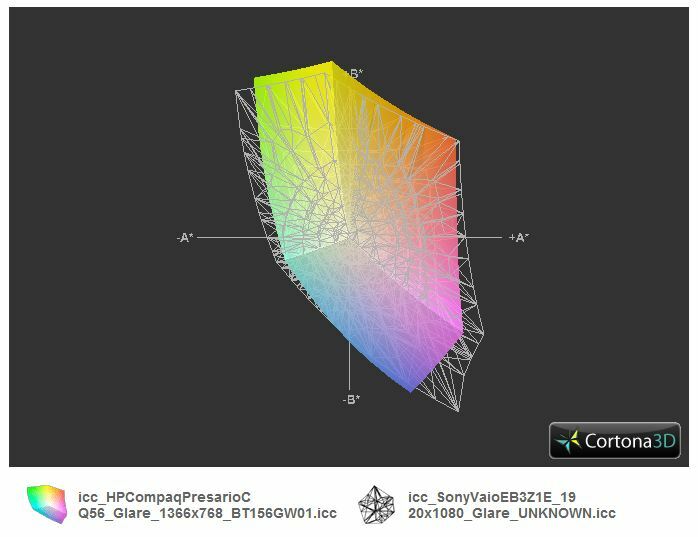 For comparison, we used the appealing (but not perfect) Sony Vaio EB3Z1E's color spectrum. The luminosity is just as low. We determine an average brightness of merely 179 cd/m2. It's sufficient for indoors or cloudy days. Bright surroundings, as in bright sunlight or light-flooded rooms, aren't the CQ56's perfect workplace. The desktop will often be too dark here. 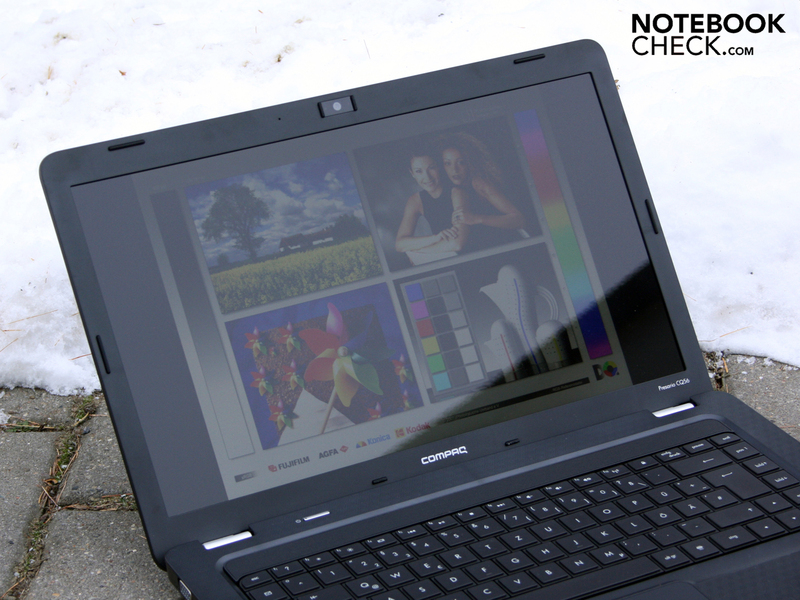 If you take the Presario CQ56 outdoors and work in direct sunlight, you'll not have much pleasure with HP's budget laptop. The 15.6 inch screen doesn't have an AR coating that prevents reflections. Non glare would be the better choice for an office notebook. 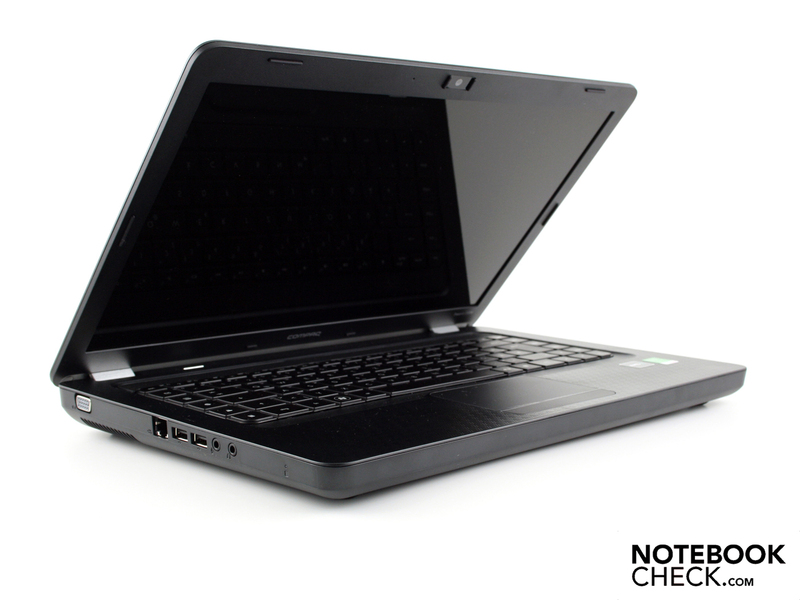 HP reserves this for its business models in the same price range (HP 620, HP 625). The low brightness of 179 cd/m2 also makes it difficult. The TFT is simply too dark for daylight use. We can deviate up to a maximum of 45 degrees from the frontal view horizontally before the screen dims and colors falsify. The inverting effect already starts at slight deviations of about 10 degrees vertically and the image dims. The CQ56's color inversions can be seen well on the darkroom pictures. 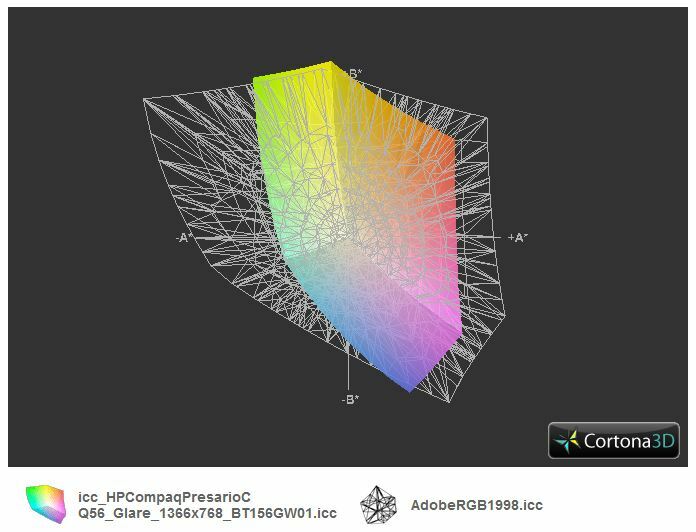 We experience the most massive restrictions from a lateral view from above or below. 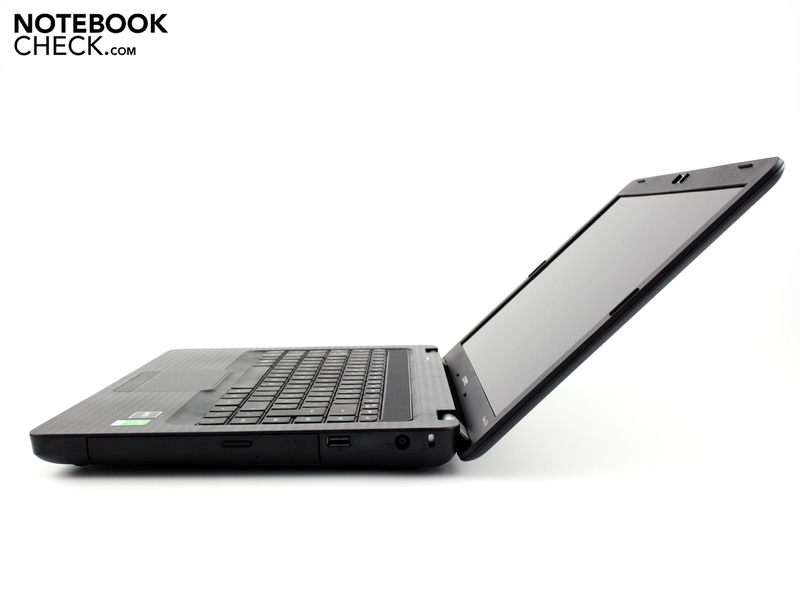 HP equips the15.6 inch budget notebook with a single core AMD V140 (2.3 GHz). The entry level CPU only has an L2 cache of 512 KB. 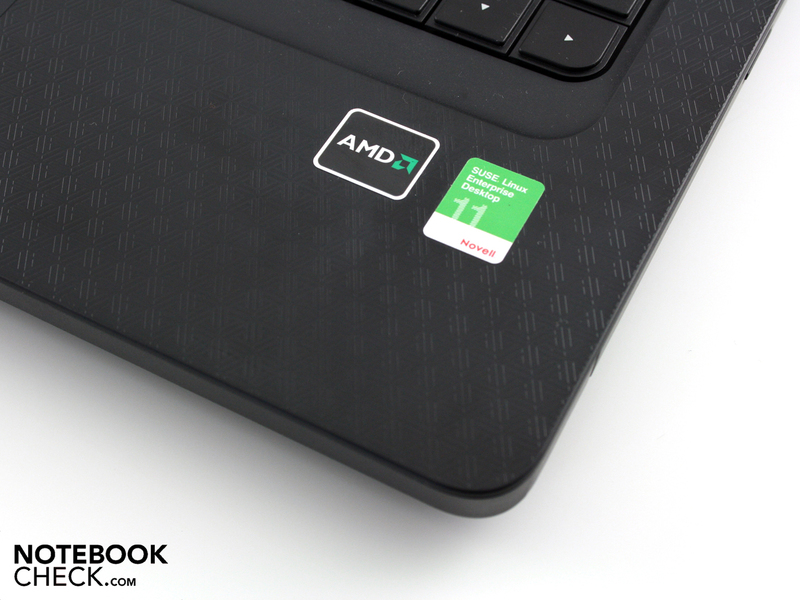 The V range designs the lower end of AMD standard notebook processors and is practically the counterpart of Intel's single core Celerons. The processor with a TDP of 25 watts is on the AMD chipset, M785, and is accompanied by a 2048 MB DDR3 RAM. Only one of two RAM bays is occupied and it can be easily upgraded. The ATI Mobility Radeon HD 4250 (IGP9 has its own 256 MB DDR2 memory, according to GPU-Z. However, this is a incorrect report from the tool. The HD 4250 uses a part of the system memory. The maximum memory capacity can't be limited or influenced in the bios. The graphics card supports the processor with a video decoder (UVD 2) in HD videos (MPEG-2, H.264, VC-1). We compare the AMD V140 (2.3 GHz) with Intel's low-end Celeron and Pentium processors in the processor benchmarks. They are found in laptops for up to 450 euro. Will the single core's performance be enough? Or will the buyer be upset after only a few weeks? Cinebench R10's 32bit single core rendering test (V140: 1923 points) lets the Celeron M 900 (2.3 GHz, 2140 points) and the Celeron M 585 (2.16 GHz, 2062) look better. Both immediate rivals of the V140 thus only compute marginally faster. Low-end priced dual corers don't do a much better job in single core computing: Pentium P6000 (2046 points) and Pentium T4500 (2306 points). Only when they compute with both cores (multi core) do they leave the single core processors from AMD and Intel behind: Pentium P6000 (3900) and Pentium T4500 (4337). Consequently, the AMD V140's (2.3 GHz) pure computing speed in about on par with Celerons (single core). Will this be seen in an identical system performance? We check this with PCMark 2005 and the newer PCMark Vantage. Both tests include all computer components, as well as DDR3 RAM, hard disk and ATI HD 4250. PCMark 2005 finishes with 2436 points. 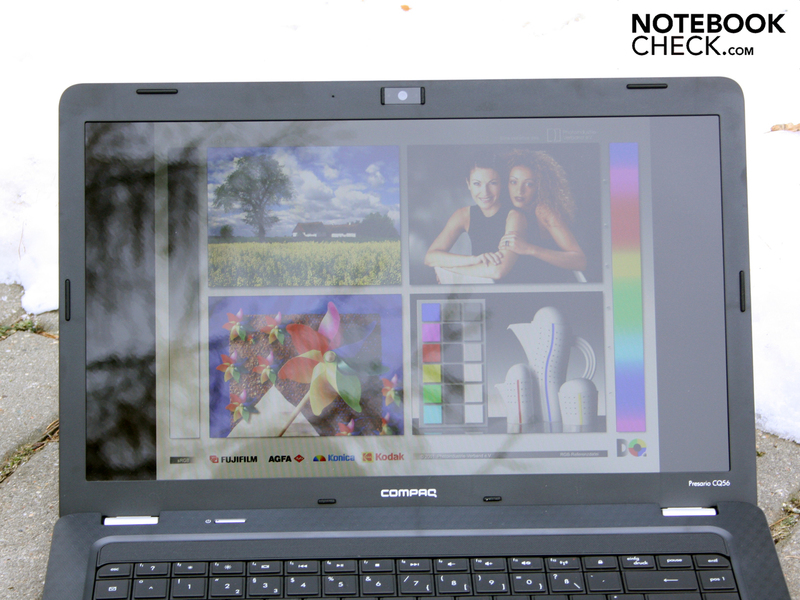 A system with Celeron M 900 (2.3 GHz, 2586) is on the same level (Acer Extensa 5230E). Despite the stronger HD 4250 (1372 3DMarks06), the CQ56 doesn't have an advantage in face of the weaker Intel GMA 4500 in the Celeron system (averagely 740 points in 3DMark06). 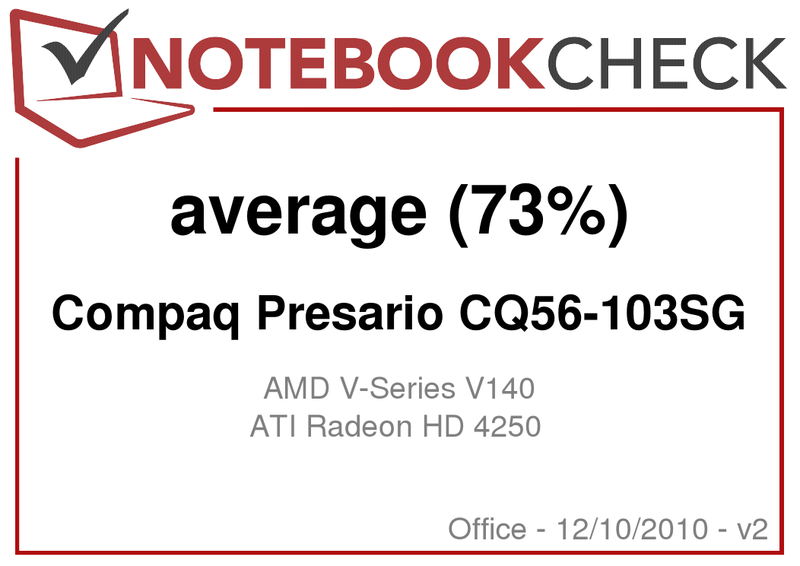 The HP CQ56's completes PCMark Vantage with 2436 points. 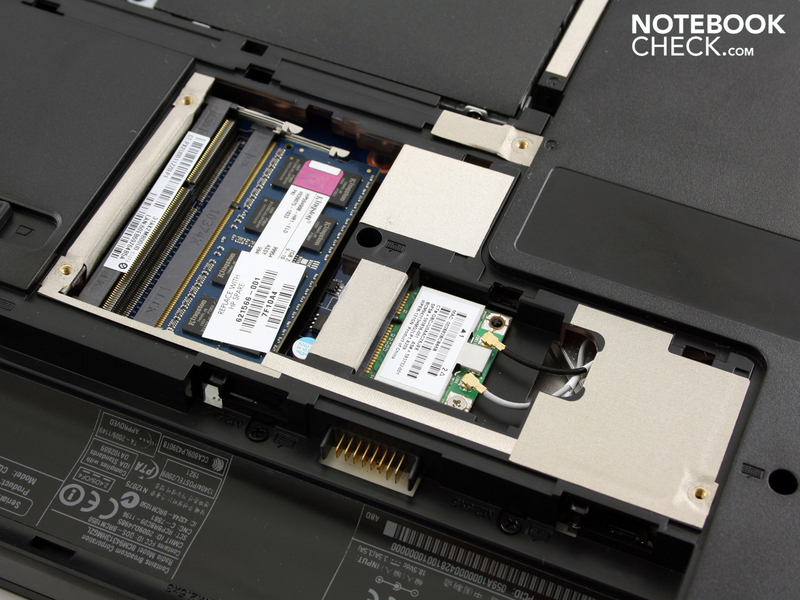 We don't have any comparison rates for a Celeron M 900 system. Dual core systems with a Pentium P6000 (3616) or T4500 (3576) clearly demonstrate their advantage of two cores and the larger L2 cache. However, these processors are first available starting at about 400 euro. If you don't want to be content with the single core performance and don't want to spend a lot of money, you could look around for an Athlon II P320. 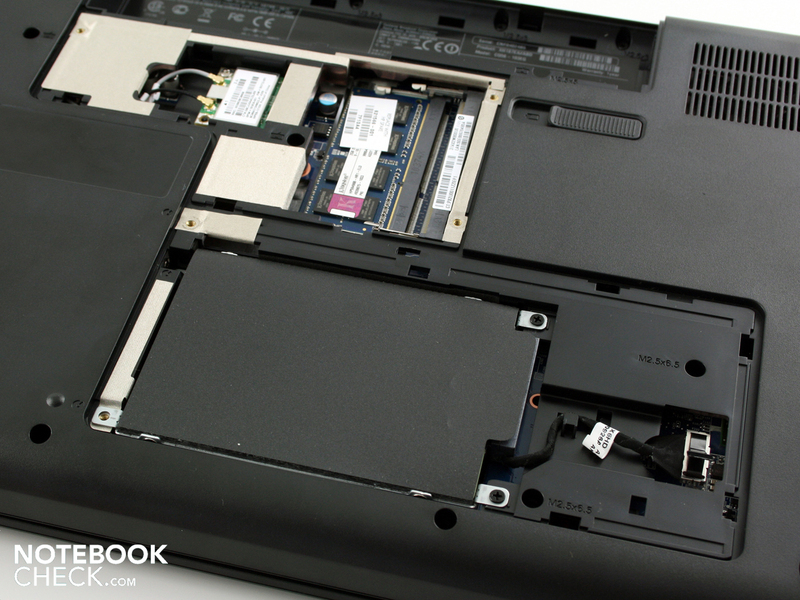 The dual core achieves a respectable 3576 points in PCMark Vantage (HD 4250, HP Compaq Presario CQ62-A04sg). The Athlon II P320 is already available in HP's 625 for 325 euro (matt display!). You should really consider this low surcharge. The experienced application performance based on the AMD V140 (2.3 GHz) is fast enough for less and simple applications (under Windows 7 64 bit). However, when a program uses the CPU intensely, the speed of other applications is clearly reduced and latencies turn up. This performance is quite sufficient if you only have a browser window open and are editing a Word document. The 5400 rpm rotating hard disk from Hitachi proved to be a mini highlight of the CQ56 (250 GB, HTS545025B9A300). It reads data from the rotating disks at a speed of 65 MB/s in sequential read (HDTune). This is an average rate for 2.5 notebook HDDs (5400 rpm) in any event. CrystalDiskMark 3.0 determined 72 MB/s (read) in another test program. Also an average rate in comparison of this benchmark. The burst rate of 135 MB/s is fairly high. This is the data capacity that can be read from the cache within one second. 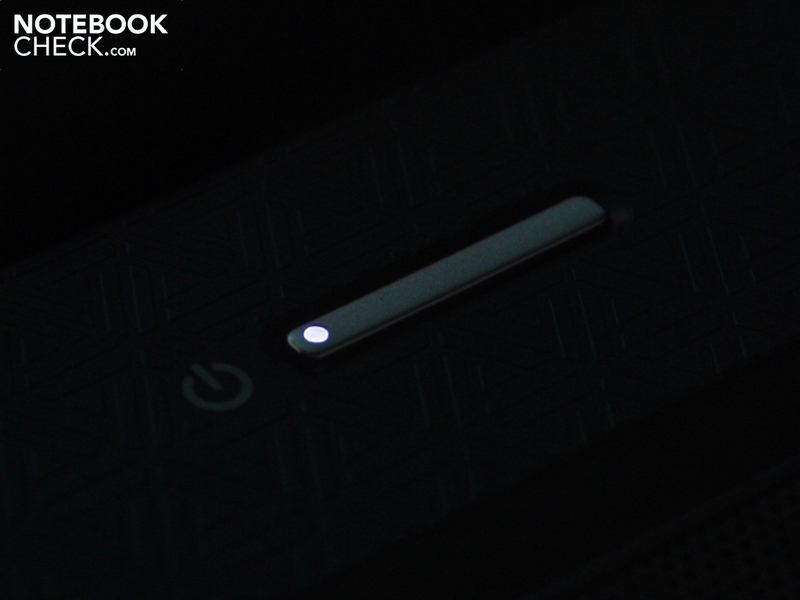 By the way, the hard disk's LED indicators are almost invisible on the case's left. 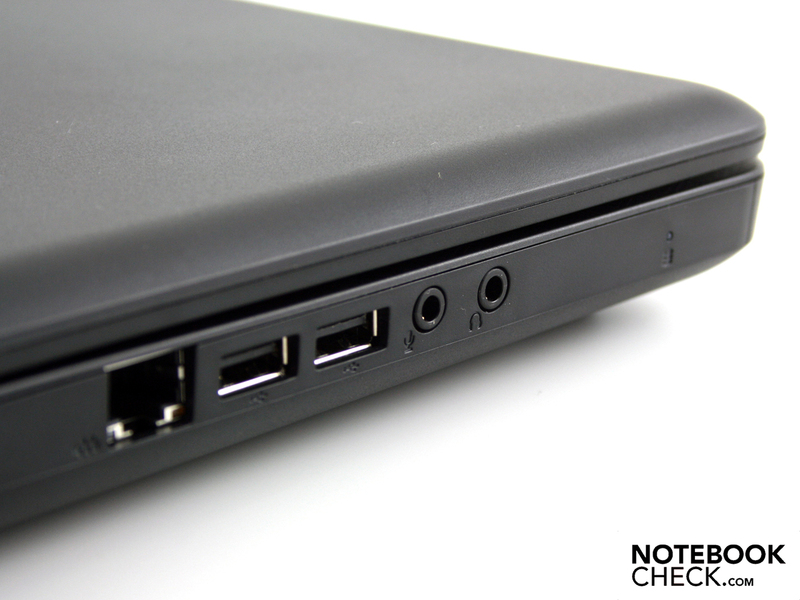 HP's 15.6 incher usually doesn't show any irregularities in term of system noise. However, the fan has a bad habit. It increases suddenly in regular intervals, just to fall to the lowest level within 20 seconds. The fan fluctuates from 30 dB(A) (fan off) up to 33.0 dB(A) (fan after increase) in idle. This increase takes place for 60 seconds during web surfing (CPU load of about 15%). Thus, the user permanently hears the fan, no matter if while writing emails, listening to music or writing in Word. A consistently rotating fan would have been more agreeable. The solution is near via the bios settings "Fan Always ON" that we also enable. The bios can be called up via F10 during booting, by the way. Now the fan at least rotates constantly with 32.0 dB(A). 3DMark2006 majorly loads the chipset graphics and provides for a level of 35.1 dB(A). We can only drive the fan to 38 dB(A) in the stress test (Furmark & Prime95) of two hours. The hard disk is almost never audible in operation. The read/write head's quiet clicking and whirring can't surpass a noise level of 30.1 dB(A). Overall, the fan management makes an acceptable, but not good impression. The up and down of the rotation speed can fortunately be turned off in the bios and the consistent whirring is tolerable. The top's average temperature is only 25 to 28 degrees during text editing and web surfing. The wrist-rest remains within the blue field during this. The bottom heats up more, but doesn't even reach the 30 degree mark. The temperatures only tend towards the red field under heavy load more clearly. The measurements determined 38 degrees selectively on the top during the stress test. This doesn't yet provide for hot fingers since the keys stay cooler with 30 to 36 degrees. The bottom now reaches maximum temperatures of 42 degrees in the upper center. The processor's temperature sensor reports a maximum of 68 degrees during a 100 percent load of CPU and GPU. This is an indication for the cooling system's successful heat discharge. The Presario CQ56 has two stereo loudspeakers above the keyboard. There is no subwoofer for improving basses. The midranges' and trebles' sound is balanced. The loudspeakers don't render basses at all. Not even when "BassBack EXP" is enabled in the sound enhancements. The changes can only be heard slightly. The volume is good for a 15.6 incher. There aren't any distortions or scratching at the maximum level. 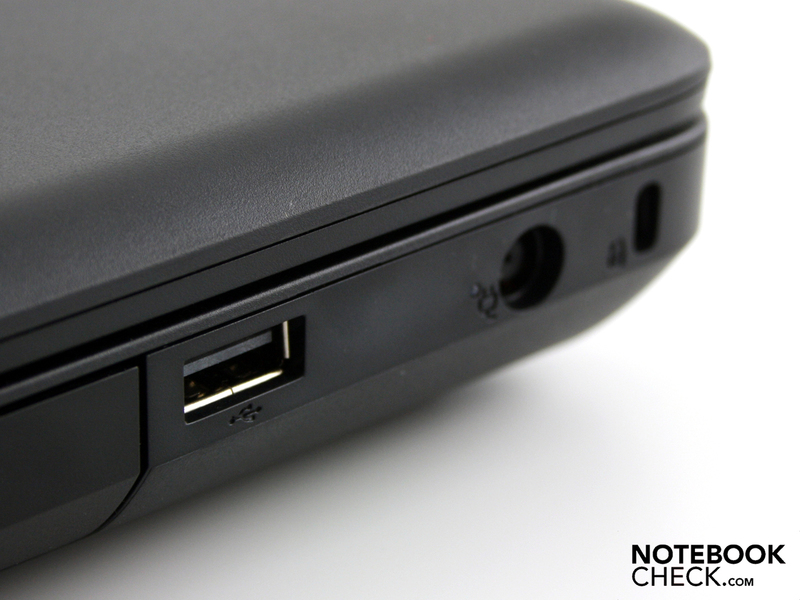 Cheap laptop = short battery life? 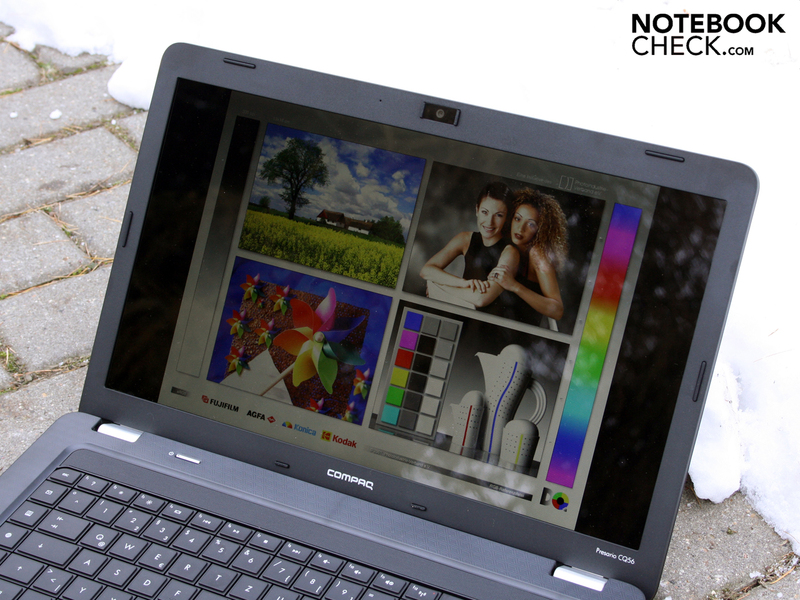 The Presario CQ56 proves the opposite with 3:26 hours (WLAN surfing, 206 minutes). The battery life is only a lot shorter under high processor load. The 25 watt AMD V140 manages to drain the 4200 mAh battery (47 Wh) after 1:17 hours (77 minutes). Users can increase the runtime to 4:35 hours in idle mode (BatteryEater's Reader's Test). This battery runtime is irrelevant for everyday use because no one will use a notebook with the lowest brightness, without WLAN and additionally, without processor load. A DVD movie first ends after 139 minutes (2:17 hours). The battery is ready for the next movie session after 1:59 hours. This is how long it need for a full recharge. Frugal buyers want frugal notebooks. 13.7 watts in idle doesn't sound like much, but in view of the low system performance (in comparison to i3/i5) it is very high. 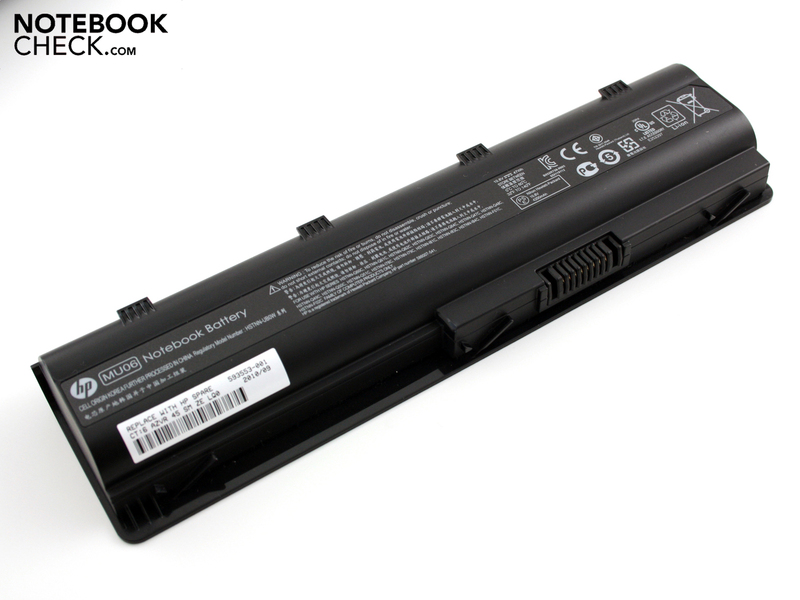 We would name the Acer Aspire 5741G as an example. This 15.6 incher, equipped with a considerably stronger Core i3-330M CPU and dedicated GPU (HD 5470), is a lot more economical with 10.5 watts. Users should take care to work in energy savings mode or only in the balanced mode. The processor only reduces its clock rate dynamically in these modes, and reduces the system's power consumption to 14 – 17 watts. A steep 23 watts is consumed in idle under high-performance. We determine the maximum power consumption via Prime95 and Furmark (stress test). The multimeter now indicates 43.8 watts. The 65 watt adapter is sufficiently sized. The power consumption is 41.7 watts when only the 25 watt CPU is processing. 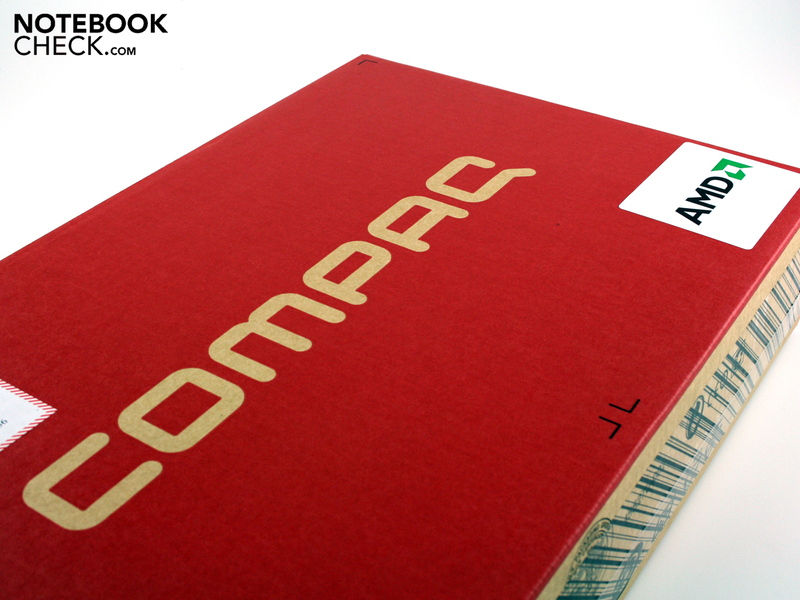 299 euro – have we waited for this notebook? Yes and no. 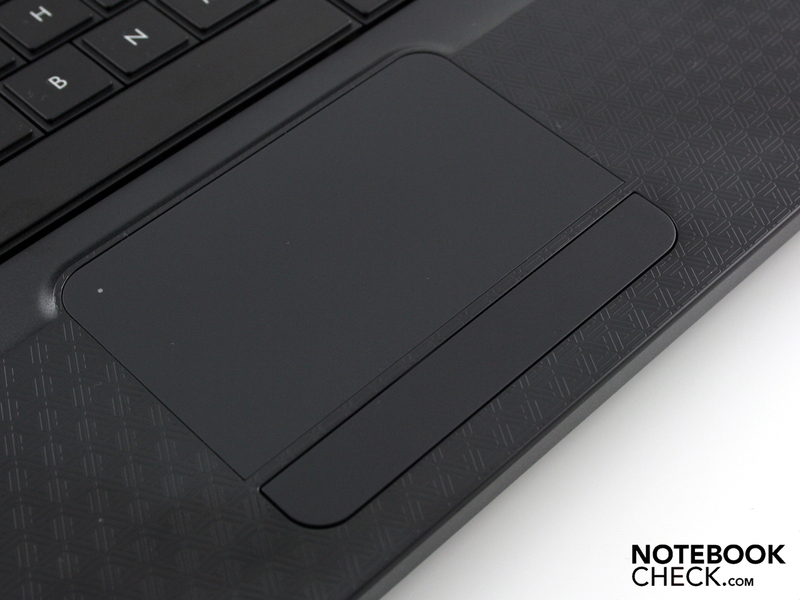 For one thing, HP proves in how far laptops have closed in on workmanship these days. No creaking, no twisting and no cheap toy look (see learn computers). If the HP Compaq Presario CQ56-103SG didn't have the weakest hardware, it could have passed as a 600 euro device and no one would have complained. 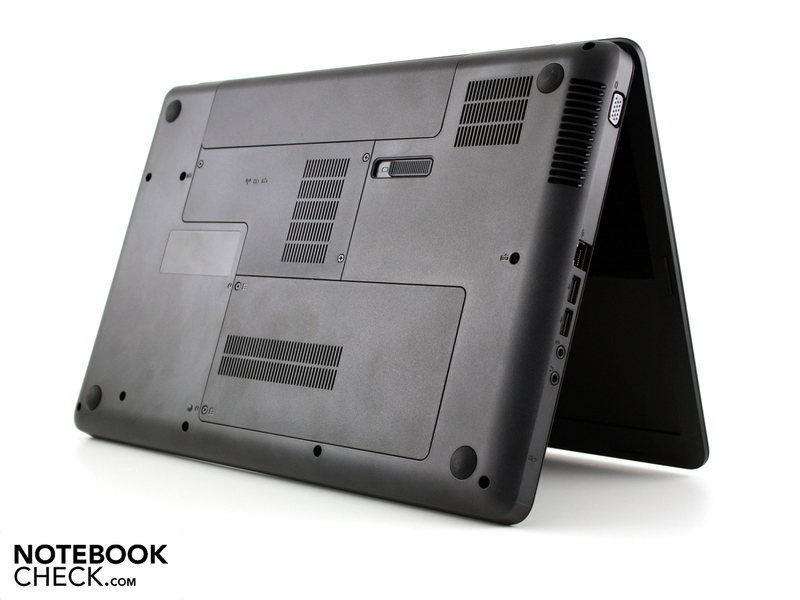 A solid case with pleasantly resistant surfaces wouldn't be anything special. But in view of the 299 euro price, a well constructed and durable case is a remarkable achievement. In the meantime, the retail price has increased slightly to 319 euro at Amazon.de. On the other hand, a weak single core processor can't be blandished. Dual core alternatives are already available for 30-40 euro more and potential buyers should really consider this step (e.g. HP 625 with Athlon II P320, 2x 2.10 GHz and matt TFT). 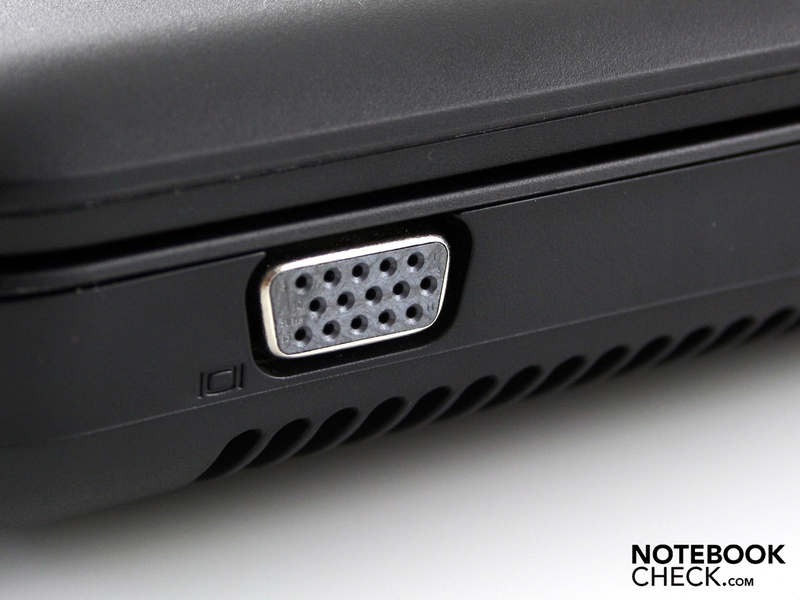 Moreover, HP has cut back on basic connections like HDMI and a cardreader. 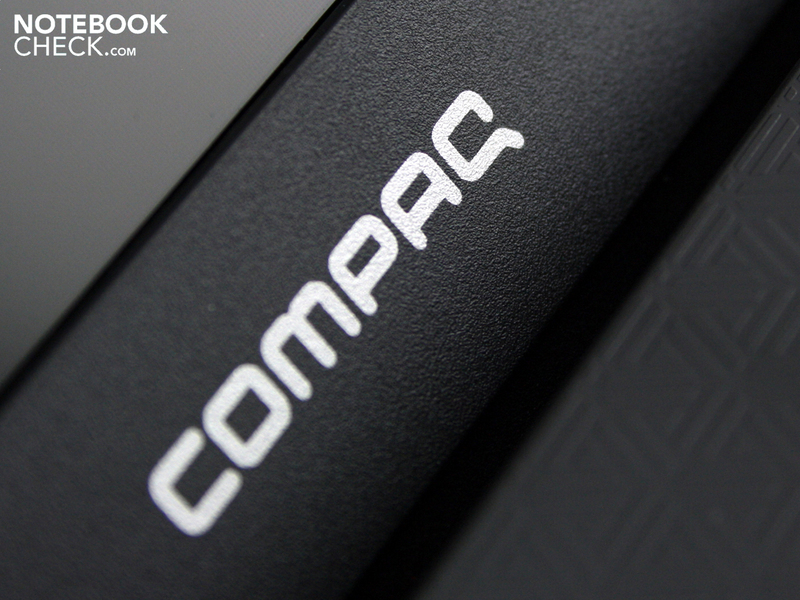 Criticism has to be passed on, but we did quite like the Compaq Presario CQ56. A well working 15.6 incher with viable inputs can be in your home for a nominal price. You will, however, have to invest a few euro in an operating system since that isn't included in the CQ56 (Suse Linus Enterprise Desktop pre-installed). If you have to haggle for every euro, but want as much notebook as possible for 299 euro, you currently won't get around the HP Compaq Pressario CQ56-103SG. 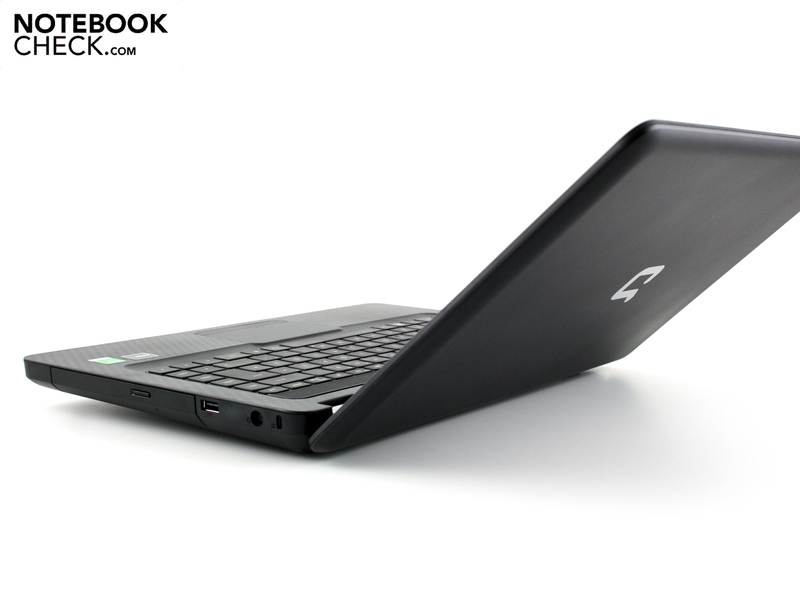 Alternatives for this price are only available as a netbook with even weaker performance. A 15.6 inch laptop for 299 euro? The hinges are reinforced with aluminum (not massive). The power on button is inconspicuously placed above the keyboard. It indicates the operating state with a soft light. Large, soft feet keep the 15.6 incher secure on the desk. 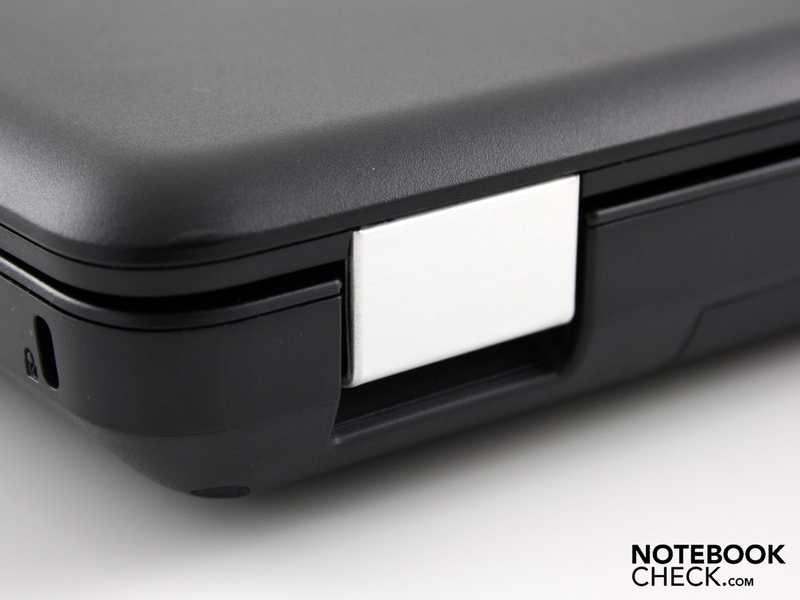 The hinges' aluminum cover is a clear contrast to the other monochrome plastic. 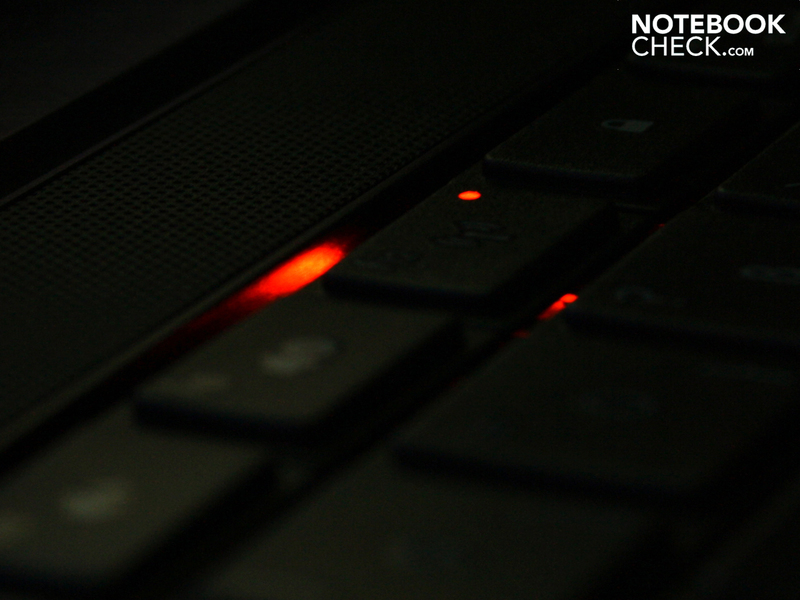 The WLAN key lights up during activity. A 65 watt adapter supplies the CQ56 with power. The power adapter is quite light with 255 grams. The bottom releases the battery with a tip of the finger. The lithium ion battery supplies good 47 watt hours (4299 mAh). We can only remove the two covers on the base plate. 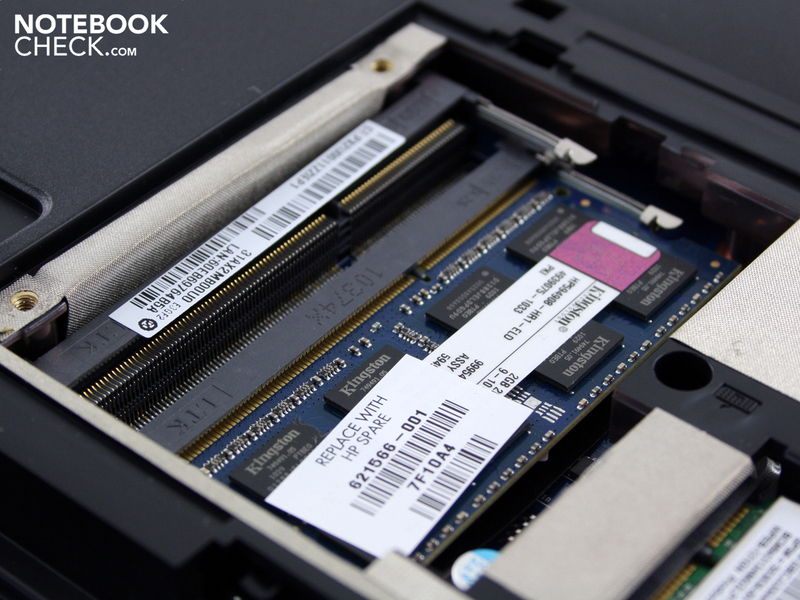 The RAM and WLAN module (mini PCIe) are found underneath. 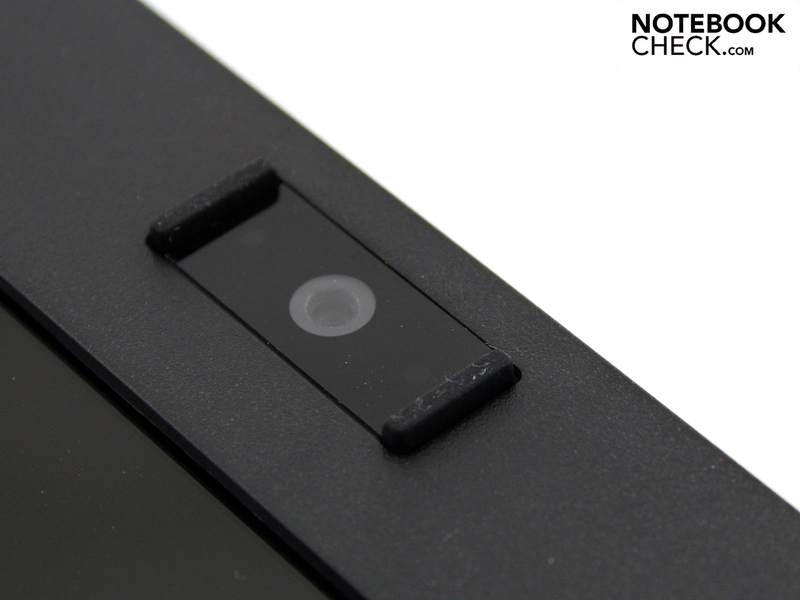 The webcam has a rubber stopper on the left and right. 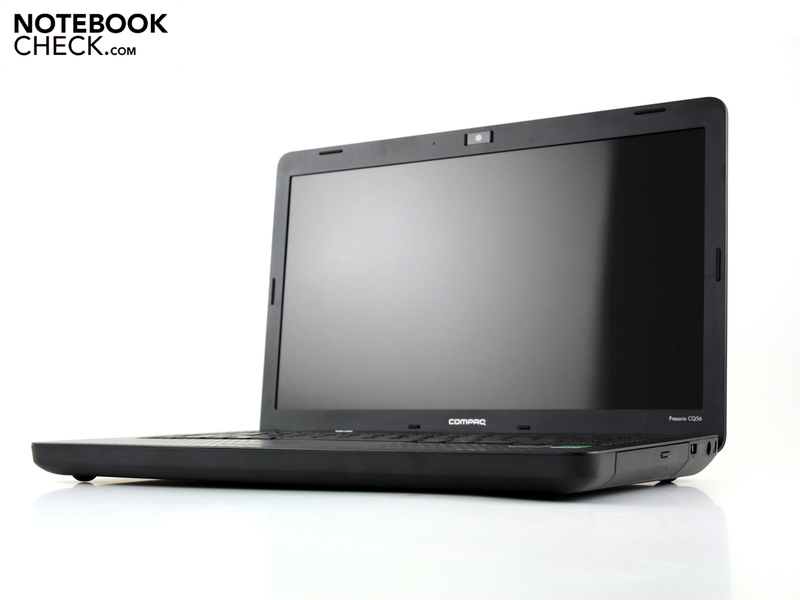 The Compaq Presario CQ56 doesn't differ much from its expensive office colleagues in terms of optical details. 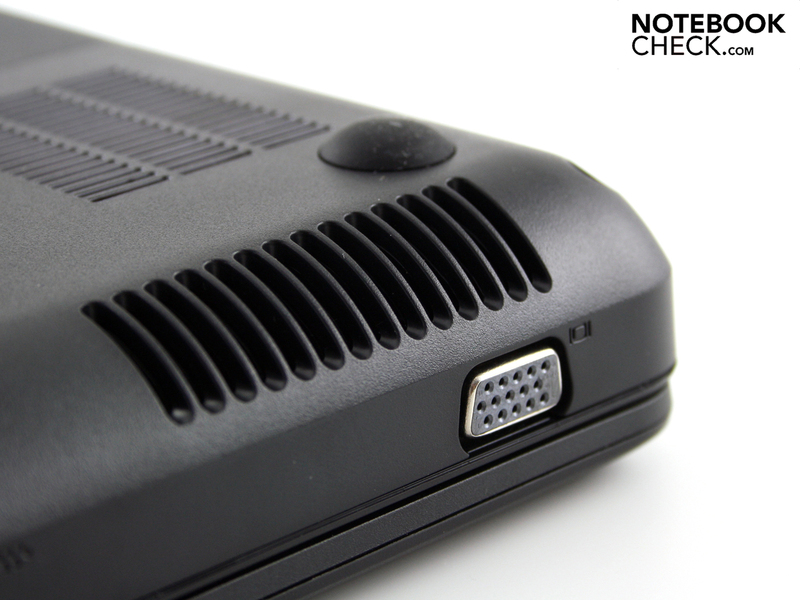 The manufacturer has cut back on HDMI, cardreader and ExpressCard (TFT only to VGA). 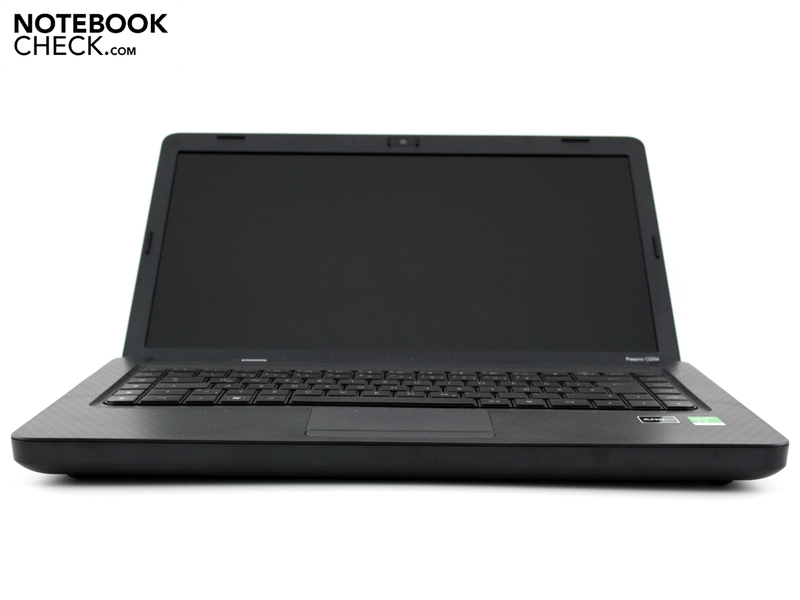 …as the Compaq Presario CQ-103SG (XH187EA). 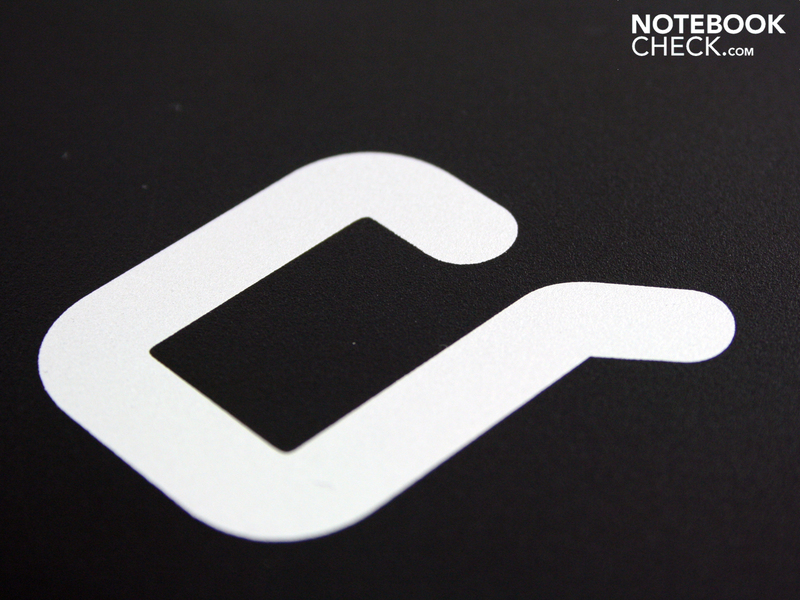 The plain notebook is in the shelves of countless retailers. Too cheap to be true? Is hands off good advice? The exterior looks aren't at all bad. The glare type screen is a matter of taste. The case's otherwise matt surfaces could be nice. The wrist-rest's stability and tight hinges are very good. The lid can be opened to about 135 degrees. The same applies to the base unit: it can hardly be twisted. The wrist-rest is adorned by a texture and makes it slip-proof. The 15.6 incher isn't even overly heavy with 2436 grams. The keys are office suitable with a firm stroke and good keystroke length. The few connections (USB, power) aren't up-to-date. Our test device only has one 2 GB bar. The second bay is empty. Resistant surfaces everywhere you look. Practical hot keys on the keyboard, stable hinges reinforced with aluminum. The price. How can a profit be made here? The case's quality is remarkable in view of the low price. Everything sits tight where it belongs. HP 625: dual core with matt TFT and more interfaces starting at 325 euro; HP 620: more performance with Intel's dual core; HP Compaq Presario CQ62: higher quality and with dual core; MSI CR630: technically almost identical, but with eSATA and ExpressCard; Samsung R530: extremely quiet; Fujitsu LifeBook A530 & Lenovo IdeaPad G560: affordable Core i3 office starting at 450 euro.